Everyone needs a place of retreat, a place to restore one’s soul. Through the long winter I pictured it only in my dreams. Serene. Meditative. Calming. My happy place. Ah, that’s better. Wave goodbye to the dark, dreary, landlocked days of winter. Shed the layers of thermals and fleece. 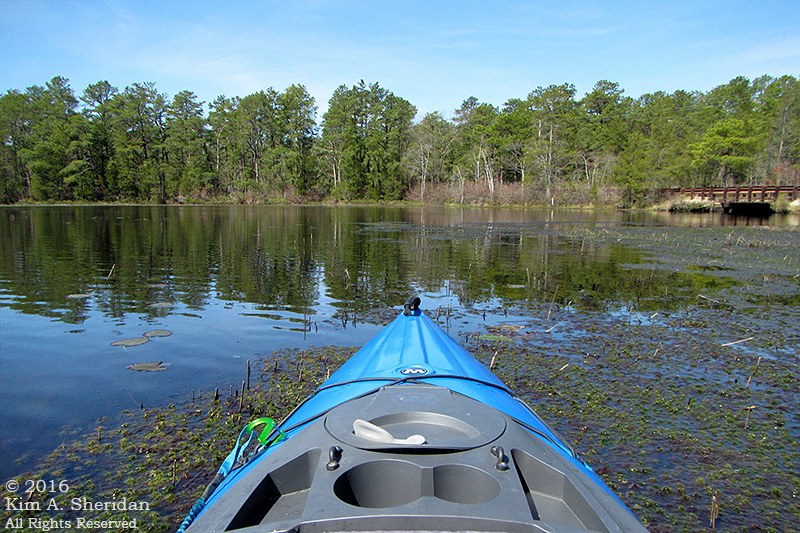 Wade through the shallows, and settle into the kayak. Turn your face to the warming rays of the sun. Now, dip the paddle blade into the water, and smoothly, gently, pull. Feel the boat glide effortlessly forward. After six long months on land, I am once again a creature of the water. 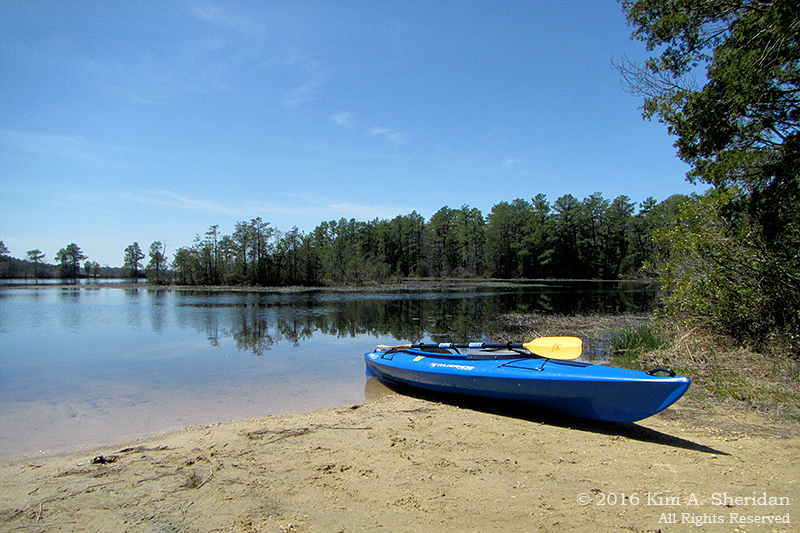 Blessed with a warm sunny day in the middle of April, I pack up my kayak and head for the Pine Barrens. Lake Oswego awaits, glittering indigo under a clear blue sky. No longer a dream, my happy place is now reality. 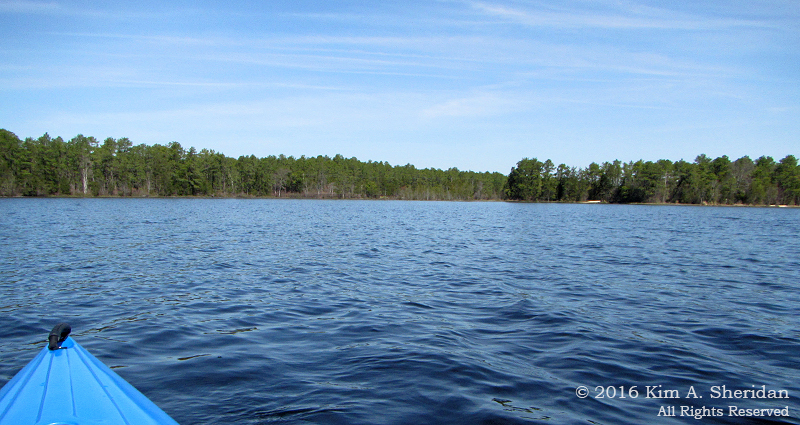 The water of the lake flows dripping off my paddle, and runs chuckling down the length of the kayak’s hull. The first strokes are awkward, and I find myself paddling not across open water, but through a mass of lily pads and dark green pondweeds. Oops! Better watch where I am going. Hmmm. 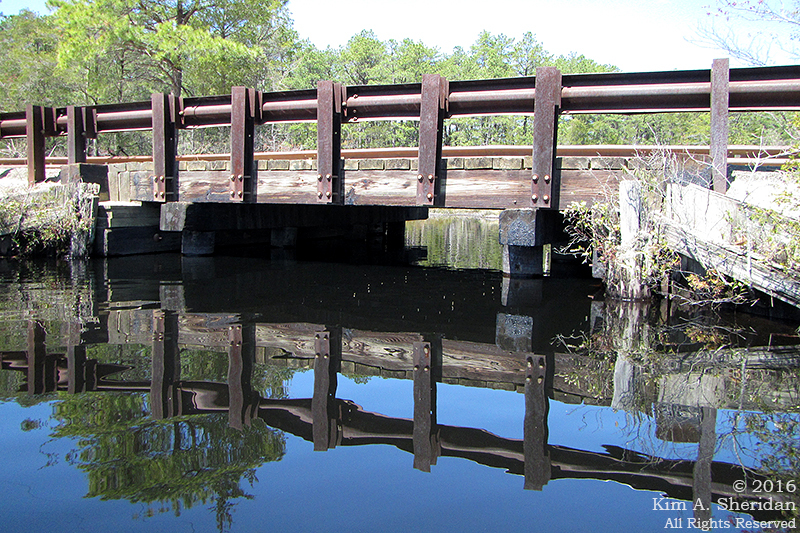 That looks interesting on the other side of the bridge. I wonder if I can fit under there? Easily spooked, turtles dive at the mere hint of my presence. 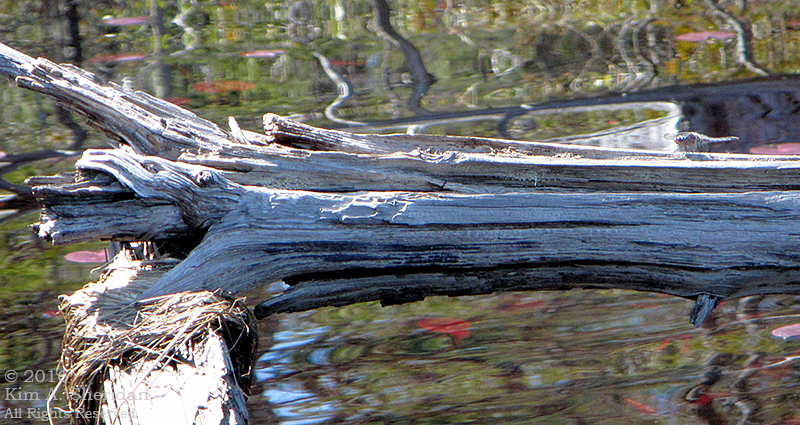 I stow my paddle and drift, and soon a turtle forgets me and begins to nibble at a nice wet salad. My happy place. Around the upper curve of the lake and down the far shore, past the dam and the portage beach. 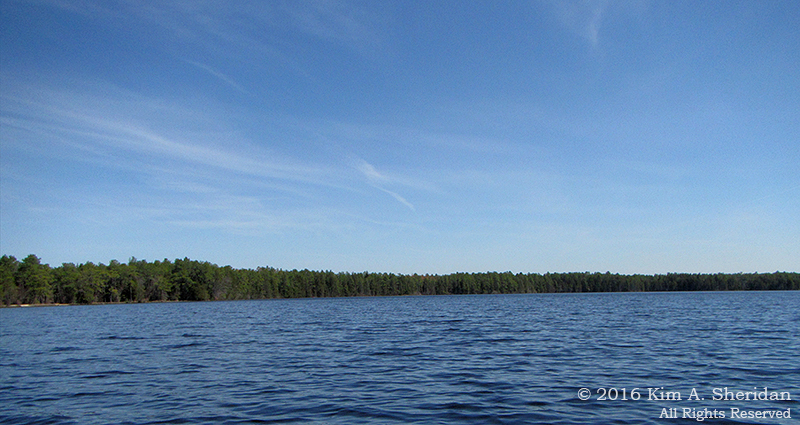 Blue sky, green trees, dark blue water. Ahhh. 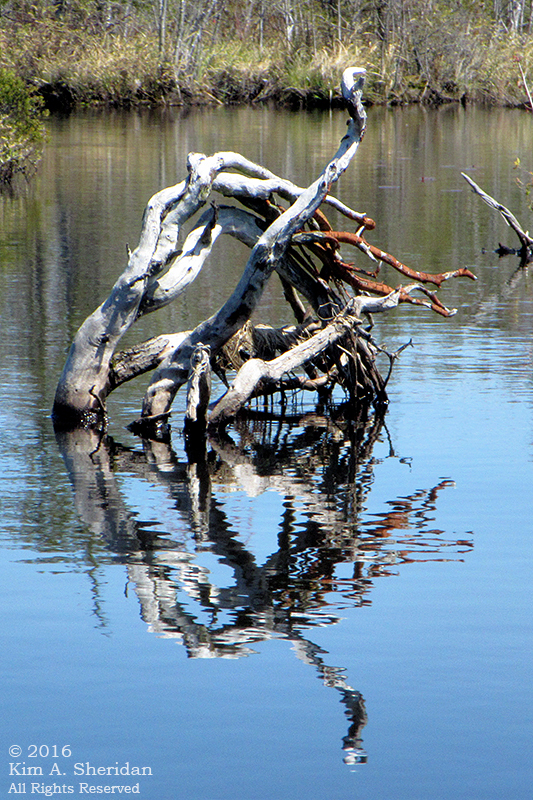 At the southeastern end of the lake, I find this fantastical sculpture, the twisted remains of a long-deceased tree. 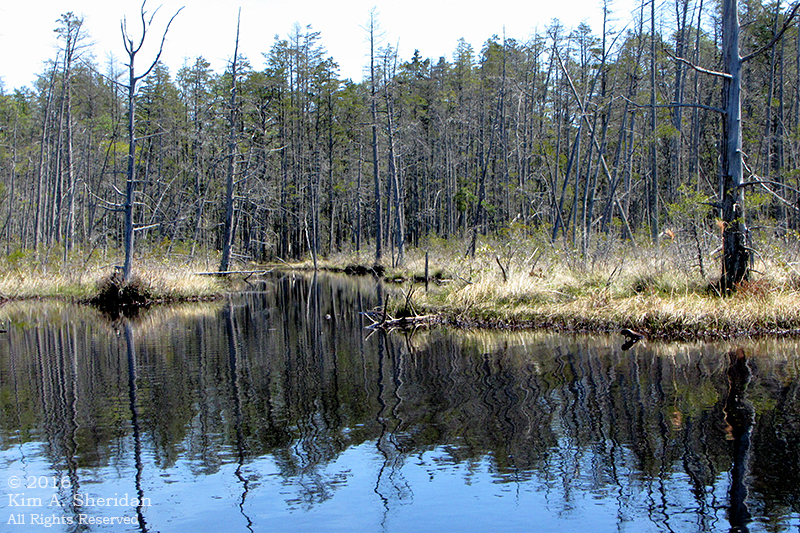 Lakes don’t occur naturally in the Pine Barrens. Something had to die for the pond to be born. My happy place is… a cemetery. 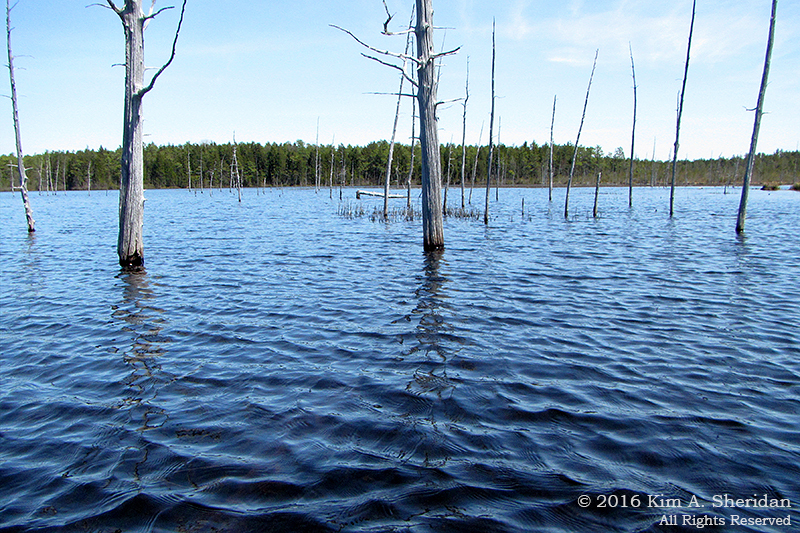 The ghosts of drowned cedar trees haunt the shallow places, a reminder of the forest that once was. Yet life abounds among the tree spirits. A fallen phantom attracts a turtle, very much alive. 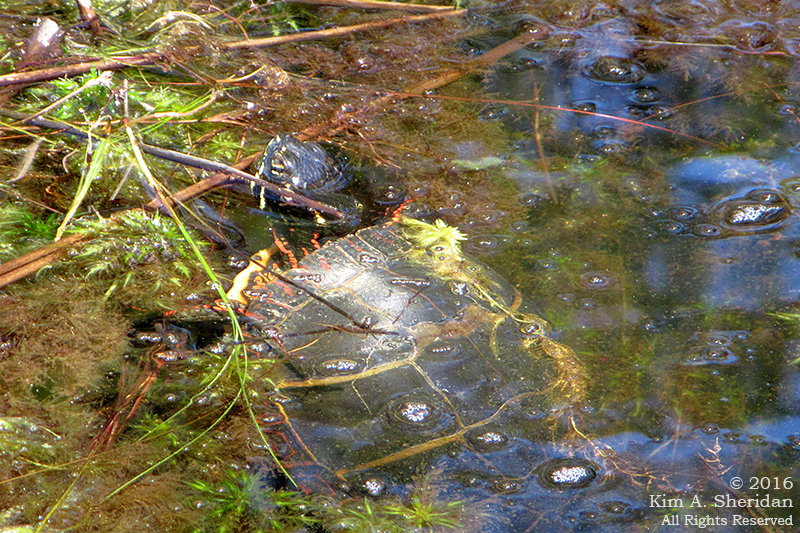 Several of his shelled buddies are also soaking up the sun nearby. 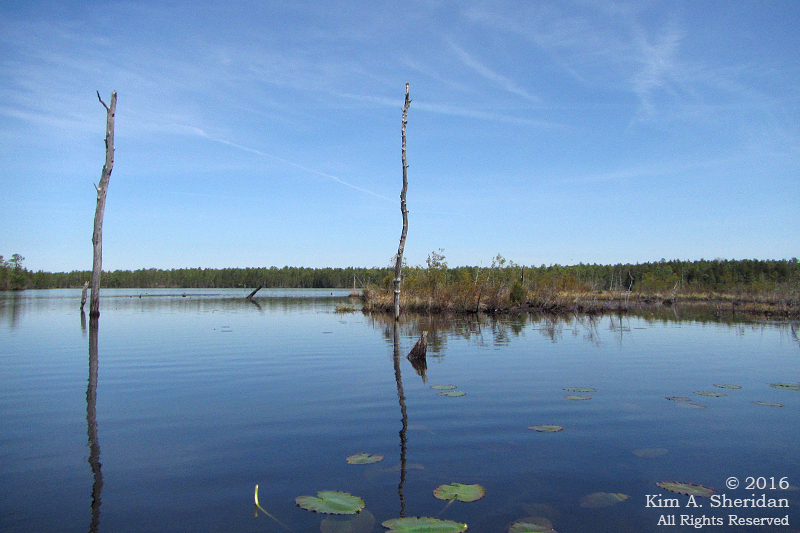 Bleached cedar tree trunks are the totem poles of the Pine Barrens lake, the resting places of arboreal souls. I drift among them like the clouds wisp across the sky, soaking up the twitter of tree swallows. A spectral white trunk leans on another for support. Like the wrinkles of an old woman’s face, its weathered skin whispers of all that it has seen. 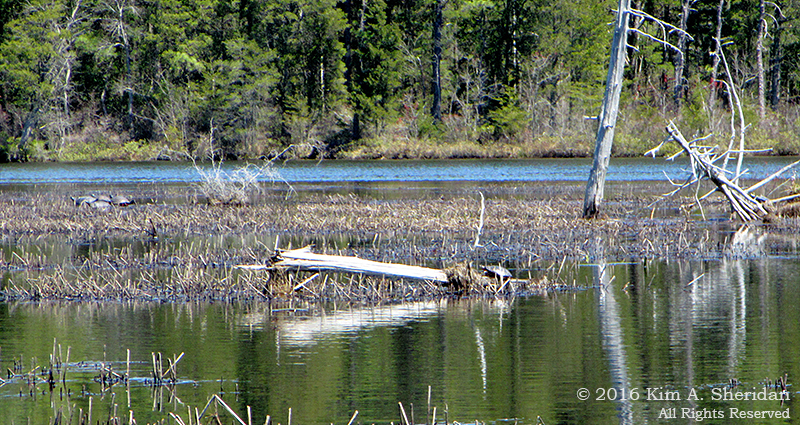 Wait – what is perched on the right end of the log? Photobombed by a dragonfly! There’s that sound again. QUONK! Like a metallic thunk. I heard a few of them near the launch, but at this end of the lake the sounds are much more numerous. No bird I know makes that sound. It has to be a frog. But what one? No matter how close I get to each QUONK, it’s not close enough. I see no frogs. One of my missions is to find where the Oswego River comes into Oswego Lake. I follow a pair of honking geese into a cove. At the far end is a narrow passage into another cove. Beyond that a thin little stream squeezes between trees and disappears. Could this be the Oswego River? But there’s another cove, with another stream beyond it disappearing into the trees. This one looks wider, more like a real stream. Hmmm. Mission postponed. Best to leave some mystery for another day. Left also for another day is this inviting little pathway. 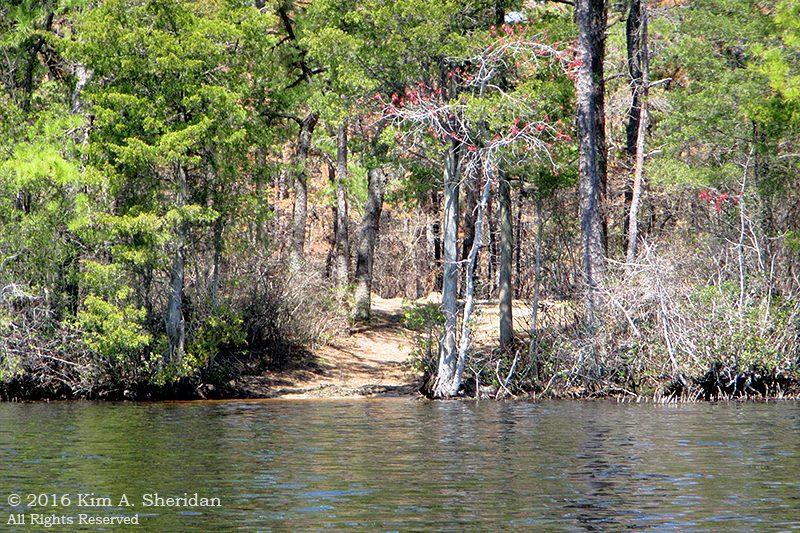 This entry was posted in Kayaking, Nature and tagged Flowers Trees & Shrubs, Kayaking, Pine Barrens, Wildlife by Kim. Bookmark the permalink.